Eco-friendly couples looking for a modern yet lush green ceremony setting in the heart of Los Angeles need look no farther than the InterContinental’s newly renovated outdoor space. 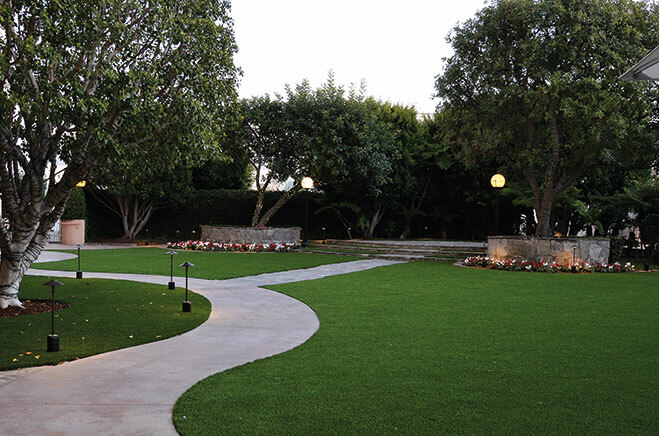 With sweeping views of Century City, the lush garden now features top-of-the-line artificial turf, which provides an environmentally friendly year-round green space. Twinkle lights strung throughout the space create a beautiful ambiance for twilight ceremonies in the garden setting. Couples yearning for a more traditional but still modern setting will appreciate the hotel’s newly renovated Grand Salon Ballroom (300 guests maximum). The subtle and elegant silver color scheme, with chrome accents and crystal chandeliers, presents a blank slate for adding your own design inspiration. Built-in LED lights and draped walls accent the ballroom, with its 14-foot-high ceiling, and a grand foyer is located adjacent to the ballroom—perfect for the cocktail hour. And gourmands will appreciate the hotel’s flexibility, as InterContinental is one of the few hotel properties in the area that allow outside catering.